Yesterday was the annual Fete de Glace, or ice carving festival, in St. Charles, MO. 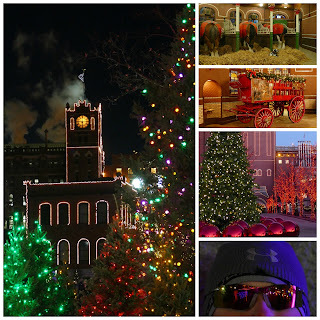 Last year a friend and I went (you can read about my experience here), and this year five of us from my Women in Focus St. Louis photography group met at the event. Last year was quite warm, creating a problem for the sculptors with the melting ice. This year weather was not an issue. It was about 36 degrees when I arrived, outfitted in my long underwear and multiple layers of clothing. Though the sun was shining, a brisk breeze kept a chill in the air. Our group met up at 10:00, with the actual festival beginning at 9:30. 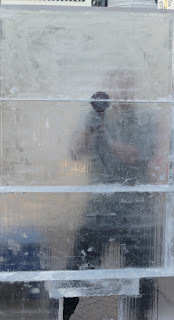 That was still early enough that we could see the prep work of the artists as they readied their blocks of ice for the competition. Each carver starts with a block of ice weighing approximately 260 pounds. 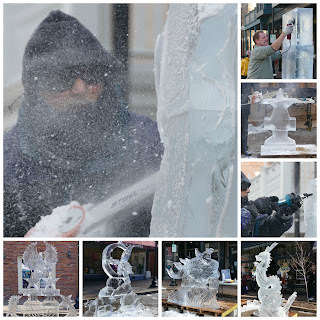 It seemed as if there were fewer ice carvers this year, although there were a few who were just beginning to carve as I was leaving a little after 1:00. So perhaps they staggered the start times in an effort to give more visitors an opportunity to see a piece from start to finish. The crowds are usually pretty light in the morning, so it was easy to get around and take pictures of the artists at work. We basically all headed off on our own for a little over an hour to get the shots we wanted. By that time we were pretty cold, so we went into one of the local restaurants to grab lunch. This is what happens when five photographers sit down to eat. Ha! Each time I am together with these women I am struck by what a unique group of individuals we are. I like our field trips where we have an opportunity to get to know each other a little better. We all may be looking at the same thing, but we each see things differently. In our own way. And that gets reflected in our photographs. Following lunch we braced ourselves to once again face the cold, and headed back down the street to see what the artists had accomplished in our absence. The crowds were much larger, and tons of people had their dogs - large and small - with them as well. It was harder to get good photos without someone in the way. I checked out a few of the new artists just beginning their sculptures, and then took off for home. I think I was the last woman standing from our group at that point. Despite the chill in the air, it was a cool event to photograph. Bah! Yesterday was my semi-annual visit to the dermatologist for skin cancer screening. Since last year was a banner year with four basal cell carcinomas having to be surgically removed within a six month time frame, I wasn't sure what kind of report I would be getting. My doctor, ever optimistic (not! ), always enters the exam room with a red plaid thermos filled with liquid nitrogen in hand. 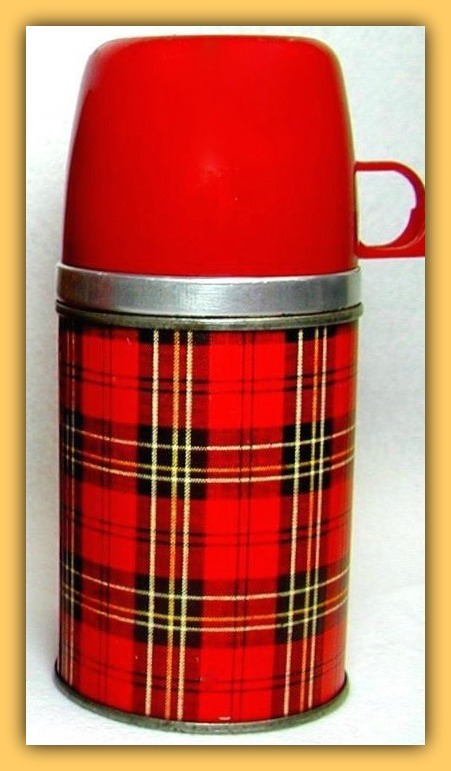 I'm old enough to remember the plaid metal lunchbox that came with this exact thermos. What a way to spoil a childhood memory! The procedure is known as cryotherapy, because liquid nitrogen is extremely cold - at around negative 328 degrees Fahrenheit. Using an extra-long, cotton-tipped swab, the doctor places the liquid nitrogen for ten seconds or so on each spot on my skin that he deems suspicious. The affected skin is frozen, and forms a blister which eventually dries up and falls off. The hope is that all the pre-cancerous cells are killed, and that the remaining cells underneath are healthy. Yesterday I had 25 spots frozen. Yikes! But the good news is that only six of those were on my face, and the doctor was not alarmed by any of the spots that he saw. I'll take that news. As someone who grew up before the advent of sunblock and spent long, summer days playing outside with my friends, I've had lots of exposure to the sun. Add in my light skin, blue eyes and the fact that I wear my Irish heritage proudly, and I am the poster child for skin cancer. As my doctor says, "You shouldn't walk from the house to your car without wearing sunblock". I try to be vigilant about this. Onto a happier topic...This weekend we were blessed with incredible weather, particularly on Saturday. I knew that my husband would go out for a motorcycle ride, so I left the house early and drove to the Audubon Center at Riverlands. Many migratory birds stop here during the winter months, and January is usually a good time to see the trumpeter swans. I wrote about visiting the center last January (you can read the post here), and mentioned that there were way fewer birds on site than in 2015. This year I think there were less birds than in 2016. I'm not sure what that means, but it may have something to do with the fact that the weather has been a little milder. 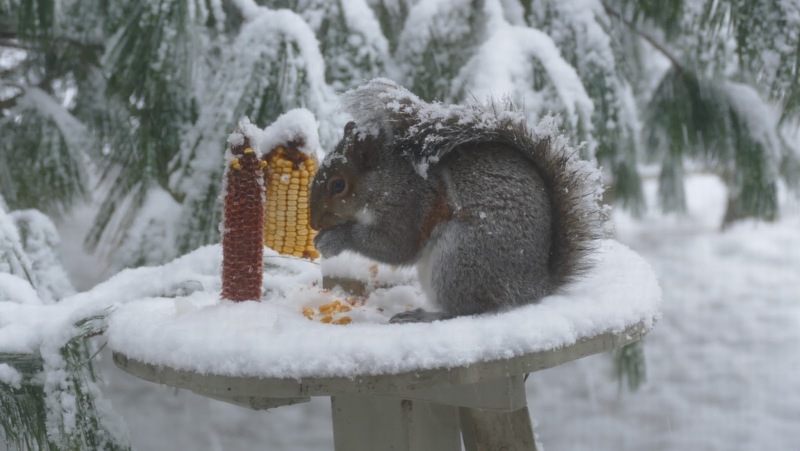 Maybe they just don't have to travel so far south to survive the winter. It was a little disappointing, though the sixty plus degree weather helped me get over it. Continuing on my drive, I crossed over into Illinois to travel on the River Road. I was hoping to spy some eagles. I saw one swooping down overhead as I was driving, but none in the trees. Normally drivers are pulling over to the side of the road to take photographs or look through binoculars, but that didn't happen either. Driving through Grafton, I saw several cars turning down a side street. Following them, I finally saw an eagle high in a tree. The other photographers there said the eagle had been in the same spot for at least an hour. 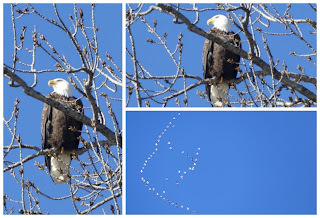 I snapped off a few photos of the eagle, and then caught this unusual bird formation in the sky. Doesn't it look like a fish? As luck would have it, my husband and his friend were also traveling on the River Road, so we were able to meet up at The Loading Dock for lunch. 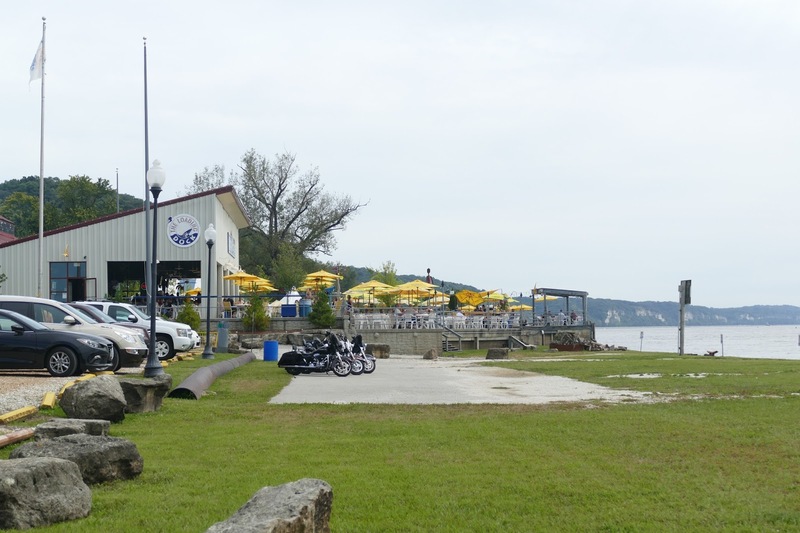 It is located right on the river, and has a wonderful patio area. It was nice enough for us to sit outside while we were eating. Following lunch, they continued north and I headed south for home. On Sunday, Jim and I took our first walk around the neighborhood together since losing Kirby. It was strange not to have him with us, but as each "first" passes, things get easier and easier. I'm sure he walked with us in spirit. We got a dusting of snow last week. As I looked out the back window into the yard, I felt saddened by the lack of dog prints. 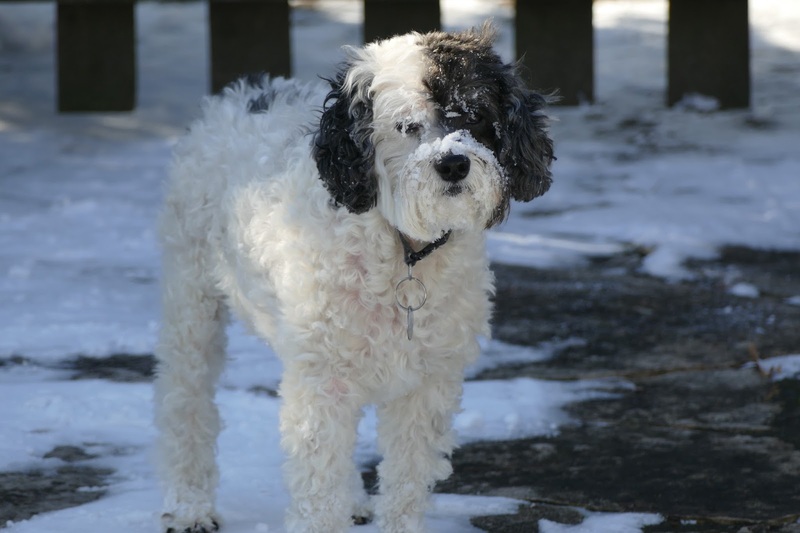 Kirby liked the snow as long as there wasn't so much that he got the ice balls between his toes, or he didn't have to walk where some homeowner had thrown down salt. That irritated his feet. Though he could certainly entertain himself when we came back inside by picking off the ice balls! The snow fall with no tracks was just another reminder of what we are missing. 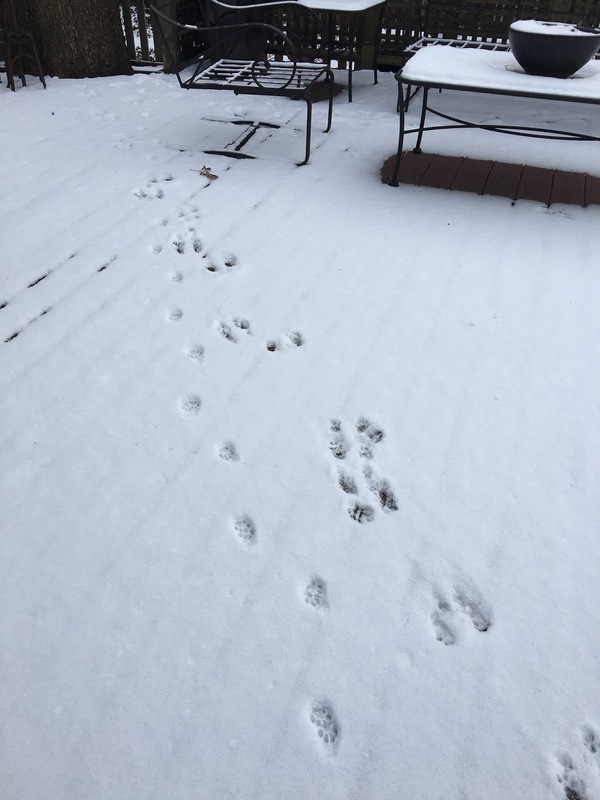 But the next morning when I opened the blinds, I was shocked to see paw prints on the deck - two different sets, actually. For just a moment I thought, "Kirby must have been chasing a rabbit." But then reality blew in like the north wind, and I realized that could not be the case. 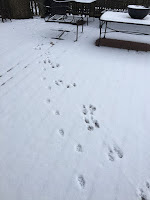 I shrugged the prints off as being the neighbor cat sniffing out a rabbit. I posted the photo on Facebook stating that I didn't know if was harder to not find prints in the snow, or to actually see some prints and think for a moment that our boy was still alive. Several people commented on the post, stating that those were coyote prints. Yikes! That thought didn't cross my mind at all. Can coyotes jump fences? I guess I can be thankful Kirby wasn't out there after all. Well, we survived our first Christmas without Kirby. It was our turn to drive to Iowa for the holiday, and it was incredibly strange not to have him with us as he was a welcome guest at my in-law's home. There is a certain gas station we always stopped at on the way up so that we could complete the trifecta - potty stops for the dog and us, fuel for the car and food for us. We could not even pull off there this trip. The memories are still too painful. In fact, we did something we have never done before by going to a sit down restaurant to have lunch. It helped a lot mentally to change things up. We also broke up the trip by stopping at a couple of Freedom Rocks. You can read more about the Freedom Rocks here. Iowa artist Ray Sorensen first painted a rock to honor veterans in Adair County, Iowa in 1999. Beginning in 2013, he established the Freedom Rock Tour, setting a goal to paint a rock in each of Iowa's 99 counties. He has since completed 45 or so of them. There are two fairly close to the route we take up to Iowa - one in West Point and one in Cedar Falls. I was immediately impressed with two things: first, the size of the rock; and second, the incredible detail in the paintings. I'll have to look for more of these when we next drive up to Iowa. There is one fairly near my in-law's town, and we thought that would be a fun family outing one day during our visit. But the weather was a little dicey we decided to save that one for next time. There were several inches of snow on the ground when we arrived, and about four more inches fell while we were there. 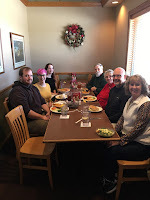 We had a wonderful time in Charles City. I had fun watching this little guy out the back window. 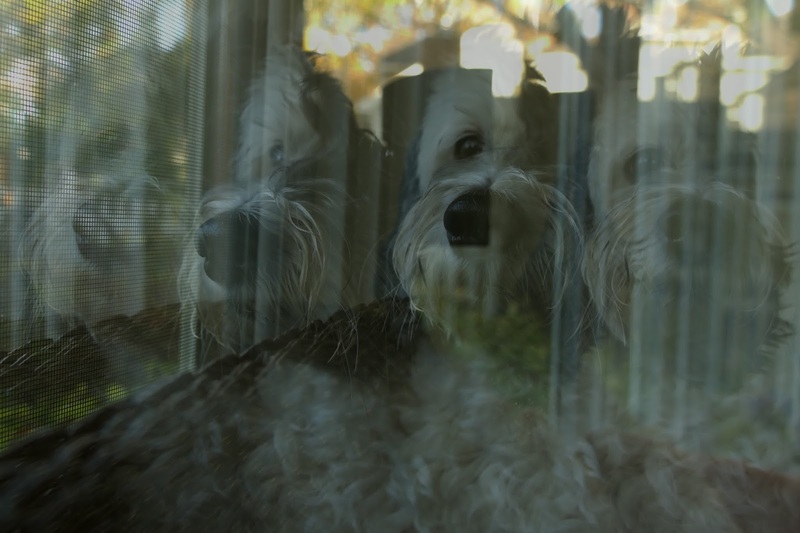 Kirby's favorite spot was on the couch in the living room where he could keep a close eye on the squirrels and birds at the feeders. I kept watch for him this year. Both of Jim's sisters were in town, so for the first time in many years the whole family was together except for a few of the grandchildren. We ate too much, played games and put together a puzzle, laughed a lot and of course received some wonderful gifts. We headed for home on the day after Christmas because Katie was flying into St. Louis on the 27th, and Andy and Megan were driving in on the 28th. We packed a lot of fun into their visits! We opened our gifts on the 28th while drinking our signature CranCherry Cosmos. Jim had to work on Thursday, so we met him at Imo's for lunch - on the must-do list for the kids. Later in the afternoon we went to Jim's office so the kids could get a tour of the latest construction before taking off for the Missouri Botanical Garden to see the Gardenland Express flower and train show. This, too, is a tradition for our family and we try not to miss it. 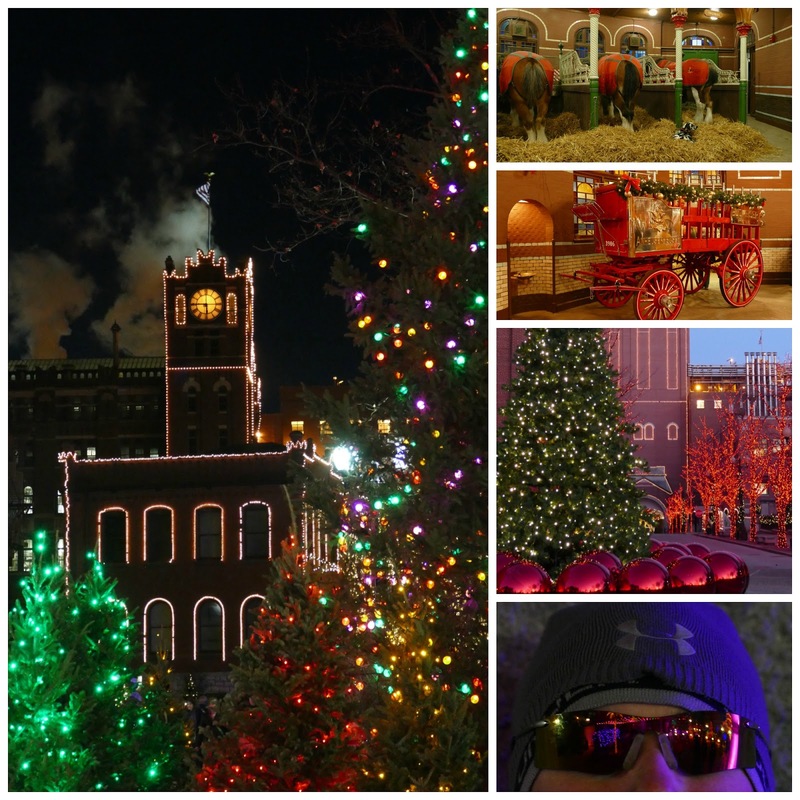 From there we drove to Anheuser-Busch to see the Brewery Lights. We were a little early, so we had to wait in the wind and cold until they began to hand out the arm bands. This is a walking tour, and you receive five free drink tickets to try out different A-B products. Andy, Megan and I went to this last year, but Jim and Katie had never been. Since we were at the beginning of the line to get in, we were able to enter the stables to see the horses. Last year there was an incredibly long line to get in there, so we skipped it. I'm glad we were able to see it this year as the stables are beautiful. It was a fun evening, capped off by a visit to the downtown location of Sugarfire Smoke House. Jim and I had eaten there on Mother's Day, and the kids had heard a lot of good things about it so that was their selection. 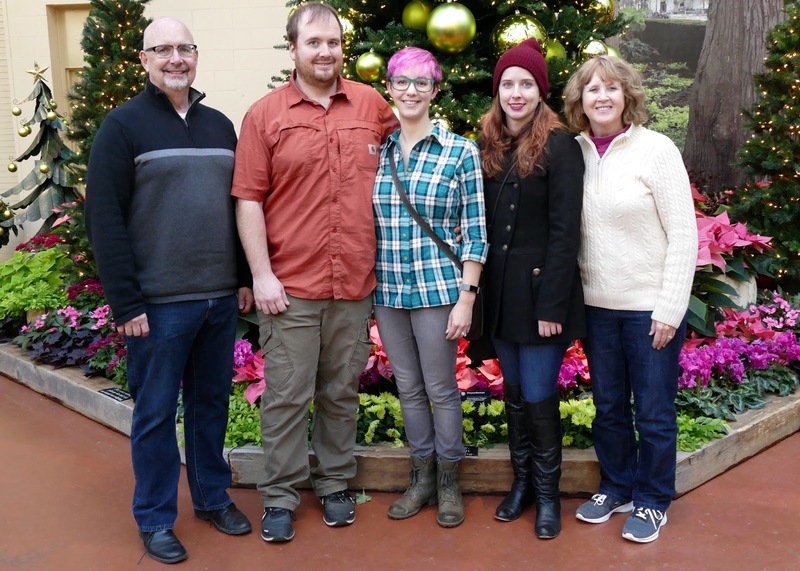 Friday we met my sister and her husband in Washington for lunch, and then we continued on to New Haven to visit Pinckney Bend Distillery where they offer whiskey and gin tastings. I don't like whiskey so I opted to just do the gin tasting while Jim chose the whiskey tasting. The kids all tried the everything selection. It was a fun change-up from going to wineries, that's for sure. We had dinner back at the house and then drove to Candy Cane Lane and Angel Avenue in south city to see all the decorated houses. Since we were that close to Ted Drewe's Frozen Custard, of course we made a stop there as well. A knock on the door a little after 8:00 Saturday morning heralded the arrival of a dozen donuts from Donut Dispatch. 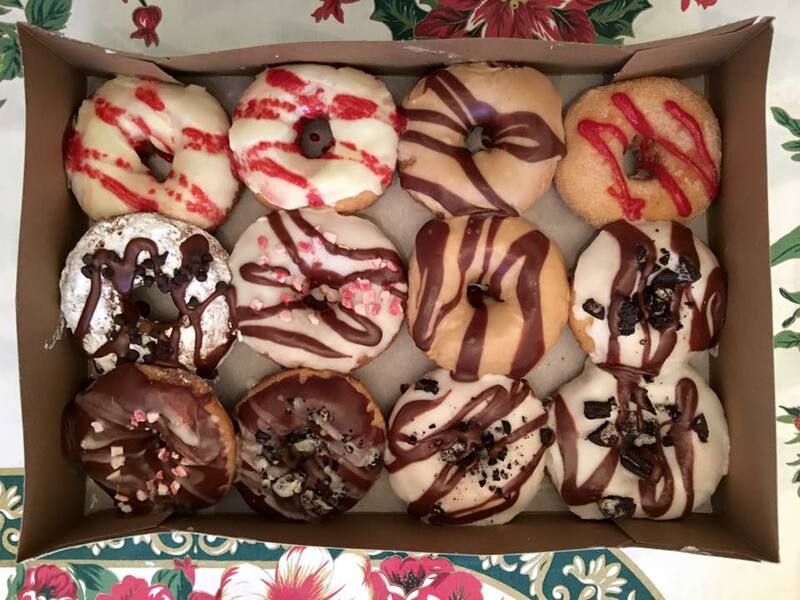 A new company in Webster Groves, they offer donut delivery on Saturday mornings only. The donuts were awesome! I was wondering aloud how this couple was able to make and sell donuts out of their house, as their label said it was a "Cottage Industry" and not inspected by the Health Department. Sure enough, on Tuesday I saw a notice on their Facebook page that they have been shut down by the city. It's too bad, but calling yourself a "Cottage Industry" does not exempt you from inspections or city licensing and taxes. Hopefully they will be able to find a commercial kitchen to continue their business. Andy and Megan left following lunch on Saturday to begin their drive home. They stopped in Cambridge, Ohio for the night before continuing on to Virginia on Sunday. Katie flew home on Monday afternoon, so all is quiet in the house again. While we missed Kirby terribly this Christmas, I am grateful that we were able to see so many of our family members this holiday. Here's hoping for a wonderful 2017!